All Chemyx syringe pumps can be controlled by a computer using an RS232 DB9 serial cable or a USB serial cable. Fusion 100, Fusion 200, OEM module, Fusion 4000, Fusion 6000, and NanoJet all support both types of connections while Nexus Legacy products only support the DB9 connection. For the DB9 serial connection, a Male-to-Female DB9 cable must be used. Do not use any null modem, crossover, or crossed-over cables. The cable can be of any length up to 50 ft; however, the speed of the connection is often detrimentally affected at lengths over 15 ft.
For a USB serial connection, a USB-A to USB-B cable should be used. The maximum functional length of a single USB cable is 15 ft; however, USB cables should be less than 10 ft for optimum performance. Multiple USB cables can be chained together to make a longer connection, as long as the hub connecting each individual cable is connected to a power supply. 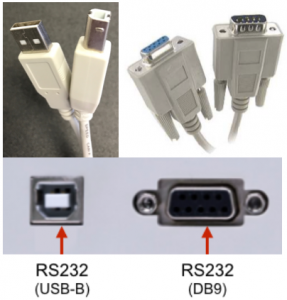 Because most modern computers typically do not come with an RS232 DB9 connection, connecting a computer to the Nexus pump, which only has DB9 connections, often requires a USB-to-DB9 serial adapter.